Grande capacité de pots de 2 pièces, amovibles et empilables, peu encombrants et faciles à ranger. - Matériel: plastique. Le forfait comprend - Taille: env. - Couleur marron. Matériel: plastique. - Grande capacité de pots de 2 pièces, amovibles et empilables, peu encombrants et faciles à ranger. - Taille: env. - Couleur marron. A wonderful cookie jar that looks like a cheerful black-and-white spotted cow wearing a red collar with a tag that reads "Cookie Jar". 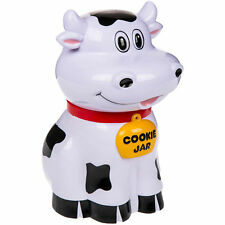 An item with sound effect - once someone reaches into the jar, the cow moos. Eye-catching, useful item for every kitchen that makes everyone smile, especially children. Remplissez la base de verre avec de l'eau chaude pour garder votre sirop ou votre miel doux et chaud si vous le souhaitez. Distributeur de sirop de miel 1 pièce. Distributeur De Miel Sirop Pr Tartin. By Emma Bridgewater. Set of 4 stacking storage tubs with lids - perfect for lunch boxes, picnics and kitchen storage that stack inside one another when not in use. Set of 4 Pink Hearts Storage Tubs. Storage Tubs. Souvent, il y a quelque chose de la nourriture laissée au-dessus ou vous avant la cuisson pour une bouchée prendre pour le déjeuner au bureau. aides de cuisine astucieux. Material Kunststoff. Farbe Grün. Capacity: 1300ml. Made of BPA Free plastic. Plastic Pitcher. Available in four colours: pink, orange, blue, green. All our International orders are sent. Assez de taille pour tenir la petite chose de cuisine. - Matériau de la boîte: Plastique acrylique. - Taille de la cuillère (longueur x largeur): env. Part of the Brabantia Tasty Colours line - for every kitchen task a colourful solution! Handy and above all beautiful. Made from strong transparent plastic so you can easily see the contents. This stackable canister is made of strong transparent plastic which allows you to see the contents inside the jar. By Emma Bridgewater. Set of 4 stacking storage tubs with lids - perfect for lunch boxes, picnics and kitchen storage that stack inside one another when not in use. Set of 4 Polka Dot Storage Tubs. Storage Tubs. Pair of 2 x Kitchen Craft New Squeezy Chefs Sauce Bottle Decorating. Wilko Airtight Food Storage Container. Airtight Seal. Ideal for preserving or storing rices, pasta, chutneys or any other foods. The unique design clamp lid has an airtight seal to preserve taste and freshness. By Emma Bridgewater. Set of 4 Black Toast Storage Tubs. Set of 4 stacking storage tubs with lids - perfect for lunch boxes, picnics and kitchen storage that stack inside one another when not in use. Black Toast. Kitchen Craft 1lb Jam Making Jar Covers, Wax Discs, Labels etc x 24 Jars Kit. Store your child's cookies in style with this Talking Dog Cookie Jar. Simply tilt its top back to listen. Requires x3 AA batteries which are included. Kitchen Craft 2lb Jam Making Jar Cover, Wax Discs, Labels etc x 24 Jars Kit. BORMIOLI ROCCO PLASTICS INVASATORE 14 CM. Idéal pour remplir les pots sans salir ni brûler les doigts. PENDANT QUATRE SAISONS PRÉSERVE. Quatre saisons est livré avec un accessoire utile pour la préparation de confitures. 5PC MULTICOLOUR BOWL SET S/STEEL WITH PLASTIC LIDS. This 5-bowl set with plastic lids can be nested together for convenient storage. Also if you have any concerns about late arrival of your item, we are happy to help. This Storage Canister & Spoon is constructed of sturdy, lightweight food grade plastic, perfect for storing baking and cooking ingredients safely. Storage Canister & Spoon. Each canister features a handy spoon and screw top lid. Pour garder vos fines herbes coupées. Ce Frischhaltedose est idéal pour garder vos herbes coupées. Frischhaltedose Herbs 25 x 11 x 8,5 cm en plastique en 4 couleurs. Hauteur 25 cm. largeur 11 cm.